GreenSocks - Instant Prices for Canberra lawn mowing! In need of a Canberra lawn mowing service? Great, we can help! You’d also love for us to arrange the whole mowing process? Fantastic! We offer just that and with easy booking and instant prices. Our Canberra lawn mowing providers cover all areas of Canberra. From Belconnen, Gungahlin, Kaleen, Mitchell, Macquarie and Bruce in the far north; to Lyneham, Watson, Dickson and Braddon in the inner north; to Campbell and Majura in the east; to Yarralumla, Phillip and Narrbundah in the inner south; to Tuggernong, Chisholm and Greenway in the far south; and even across the border to Queanbeyan; we can find someone to look after your mowing and lawn care – whether your yard is big or small, wide or narrow, flat or sloped! Once you try GreenSocks, you’ll never look back! We are the uber of lawnmowing. So, why not give us a try today? 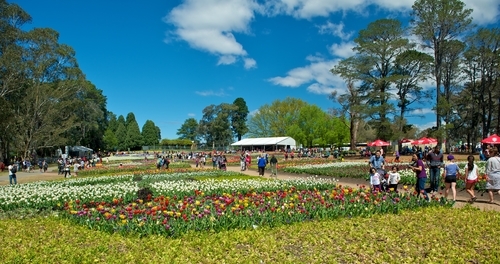 We can get your lawn mowed while you go out and do more enjoyable things like the Canberra Floriade Festival!